I have red oak and I I want that light grey ash look - How do I stain red oak floors getting the a light grey ash matted look? What is the procedure and products needed. there's a product called rubio monocoat that works well with red oak when trying to go for the grey ash look. @Walt McC Thanks for the samples on red oak! Can you tell me which color the bottom left large swatch is? I've attached an image pointing out which one. We've got red oak and using Rubio Monocoat. Any help appreciated! I know it's custom, but is there anything you can tell me about the stain? What colors were mixed? I'm struggling to find someone to get this right on my floors. Looks like it might be mixwax classic gray or a custom blend of ebony with whitewash. The milky tone to it is similar to other floors I have seen that involve either of those two. The other alternative would be rubio monocoat or another hardwax oil, since those kinds of floor finishes have gray options and pretreatments that can age the wood to a gray tone. 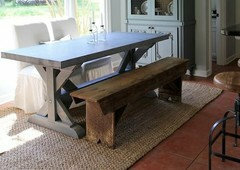 Love the table! do you know where to purchase and dimensions? - I saw the previous question about the table, and searched the site via the link provided, but could not find it...this could be perfect for my soon to be kitchen and would love to check out additional info...thank you! Hi! The link provided was to the interior design team that worked on this project so that you could contact them about the table. Unfortunately, we don't have the details in our files, but they could likely help! Perhaps start with the contact page - http://oharainteriors.com/contact/. Have a great day! 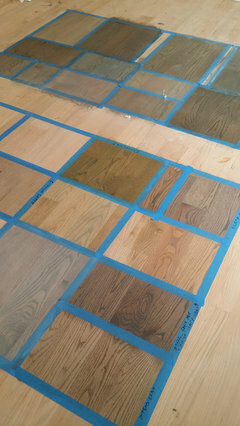 Floors - What did you use to get the floor color? Check out Rubio Monocoat Gris Belge over White Oak. Its a very similar look. The hardwood flooring is a site finished 5" Character Grade White Oak with an Eased Edge and Wire Brushed. The stain color was custom mixed on site. Floor - What kind of floors are these? with and Eased Edge and Wire Brushed. Custom mixed on site. Was it a mix of Miniwax classic gray and special walnut? Counters - It looks like your back counter is a different surface than the island. Could you tell me what it is? What is the name of the off white counter top? The back counter is Caesarstone - Haze 2030.
floors - please tell me stains used and procedures used to get the color and finish on the floor. What is the brand and color of floor? Those chairs are from Century Furniture. They come in several different finishes & Fabrics. I just did them in a clients home and they came out beautifully. Much like a classic chippendale, these chairs have a more Palm Beach lattice work which is a bit more elegant. Joy Renee Interiors, Inc.
Pendant lights - Love the lights can you tell me where I can purchase these pendant lights. can you please share where these lights are from? thx!! What is the marble island color? Yes, what is the material and color on island? The island counter top is a Honed Carrara Marble. Try Benjamin Moore's Dove White for a similar color. The grey paint is Benjamin Moore Stonington Grey. Wall color - What is the wall color please? What is the distance from the island to the table? Thanks! The distance from the island to the table is 50". Thanks for your question and have a great day! kitchen mat - looking for a light colorful kitchen mat. Can you tell me where this one is from? 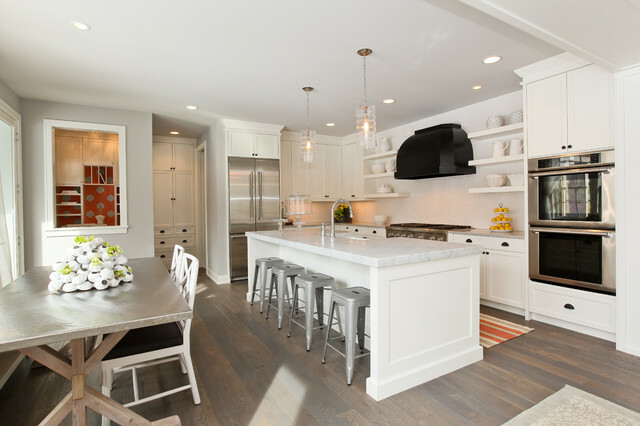 The kitchen mat was provided by the interior design team on this project, Martha O'Hara Interiors. love the pendant lights - Hi, what is the name, who sells the pendant lights? The pendant lights are the Juliska Amalia Column pendants. Kitchen remodel - My kitchen layout is going to be very similar. I've been going back and fourth with the size of my island due to the fridge. What distance is the island from the refrigerator? The distance is 37 1/2". The cabinets are Benjamin Moore White Dove. What is the counter used under cabinets that are on the wall? Floating Shelves - Hi there! Would you be able to tell me the manufacturer of the floating shelves? Can I also know the ceiling height of this kitchen? Thanks so much! Hello! The floating shelves were custom built by a local cabinet shop - JD Woodcraft www.jd-woodcraft.com. The ceilings are 9' high. Have a great day! Centerpiece - I love the barnacle flower vase thing on the table! Where from? The centerpiece was provided by the interior design team on this project. Stove Hood - Where did you get the hood above the stove? I haven't seen a black one and I really like that look. Cool stools, what are they? I don't have the details on the stools, but the interior designer provided them and could help - Martha O'Hara Interiors http://oharainteriors.com/. 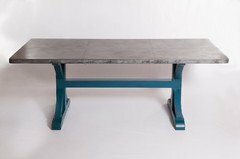 Table - Where can you purchase this table. I, too, would love to know what the counter top is? It is lovely! - Love the counter top! Thank you. The island counter top is a Honed Carrara Marble. What is that hood? Where does one purchase? What is the color of the Cabinets? Is it pure white? White paint, modern appliances and light fixtures, and metal accents and furniture update the cottage look.